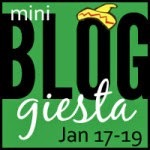 It's time for the Winter Mini Bloggiesta! I wasn't going to participate because of time constraints: I work on Saturday and the Packers have a playoff game on Sunday. (Fingers firmly crossed) But I've just learned that the Mini Bloggiesta has been extended to Monday I'm going to see what I can get done that day! 2. Participate in as many mini challenges as I can. Any excuse is a good one. Oh I should go for your twitter resolution too! I've been cleaning up my Twitter the last few days. Cut my following list from almost 400 down to 250, and there are still so many names on my feed I barely recognize. Unfortunately I don't have time for even a short list this weekend. I'm going out of town on Saturday for my baby shower, and by the time we get back on Sunday it'll be football time, and then I'm guessing Monday will be spent organizing all our new baby stuff (and writing thank you cards if I'm feeling really on top of things). I rarely do the mini-Bloggiestas anyway because I'm much more productive during the week when my husband's at work... but at least if I have no plans I can hope to find some time to myself, at the library if nothing else. But this weekend? Forget it. That's exactly the number I'm going to shoot for. I don't know if it's possible but I'm going to give it a whirl. Go you! I need to update my review archive, clean up Twitter and make lists, and ain't none of it gonna happen this weekend. Woooo! Love the short list! Good luck with everything! Thanks :D I hope I can manage this very tiny list, lol. I would love to get ahead on some posts or at least get some ideas down. Twitter could use some cleaning up on my end, too. Good luck this weekend! Ideas would be great. Posts would be even better :D I NEED to clean up Twitter before it becomes entirely unmanageable. my list is small too 1) because I forgot until the last minute 2) I dont get Monday off, so have to fit everything into 2 days not 3. But it's fun though.....suggestion though, Do you use Lists on twitter? Maybe that's one way of helping sort out your timeline. For another time perhaps? You know, I never have used lists! Hmm. I'm glad you suggested that. I'll look into it, thanks!! I need to clean up my twitter as well. I just seems like such a daunting task. Ideally I would organize it into different streams, but that's just not going to happen this weekend. How did I not even think about making lists? Gah. Lol, maybe next time?? Good luck! Cleaning up Twitter sounds like a great idea. Thanks :D I hope I can make it happen. I'd love to get down to following only a couple hundred people but I'm not sure that's realistic! Thank you, thank you. That might be a good time to do it, Michelle :D Oh gosh, I'm so ridiculously nervous. Ack. I think you might be right! We'll see how many I actually get to ;) Go Pack Go! I should clean up my Twitter, too. I think I'd use it more if I pared it down some. That's what I'm hoping for. I like more than Facebook for the streamlined feel BUT even Twitter has gotten too clunky and messy for me lately. Time to cull! Good luck! I created some Twitter lists during one of the last bloggiestas and love how it makes it easier to follow everyone. I've thought of trying the lists too. I might just explore that :D Thanks, good luck to you too! Twitter clean up seems to a big one for a lot of people. Perhaps I should look at mine too. Good luck! You're right, I've seen a number of people list the same thing :D I hope you're having a good weekend, Chrystal!